Pursuant to clause 9.5.1 in EN 1992-1-1:2004 (Eurocode 2), vertical concrete structural element is defined as column if and only if the ratio of its larger dimension (depth) to smaller dimension (width) is not more than 4. This chapter explained the method used to determine cross-sectional resistance of a reinforced concrete column, i.e. ultimate axial resistance as well as axial and bending resistances under balanced failure. 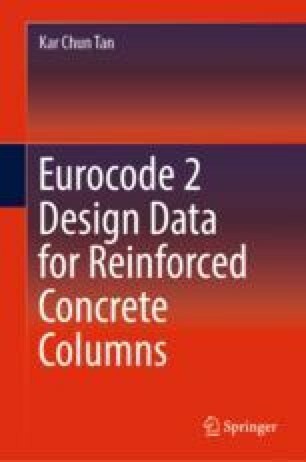 Brief write-up of column design to Eurocode 2, including but not limited to the formula, as well as method to derive and interpret column design chart. Limitations to design such as maximum and minimum reinforcement content, minimum rebar spacing, concrete cover, etc., were clarified as well. This book tabulated the above-mentioned design data in an optimized fashion. In relation to that, this chapter also explained the format of such table and the way to interpret the data from there. Illustration of all reinforcement configurations considered in this book was prepared to help the designer in decision-making during reinforced concrete column detailed design.